We are a 501(c)(3) investment ministry, a public foundation providing charitable organizations legacy and endowment opportunities for gift planning. We believe principled investors want to know that their money or assets are working for the greater good, and they want to trust the financial professionals who have the task of keeping an eye on it. In the biblical story of the Parable of the Talents (Matthew 25:14-30] Christ teaches that to those who are entrusted with much, whether it be money, assets or non-financial riches, much is expected. We are all asked to do something with what we have — invest it, or share it – but not bury it. We believe that when we are good stewards of God’s abundance, we are being faithful. 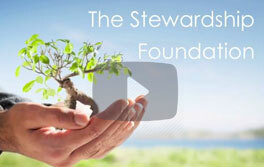 At The Stewardship Foundation, we believe that when we are being good stewards with our donors’ money, we imitate the good servants — increasing our donor’s wealth for the good of all. Grant M. Scraggs, former president of International Hair Care Products and champion for affordable housing for the poor and disadvantaged. It is our mission to continue the vision and intent of these men by providing a catalyst for positive, life-affirming change in our communities. We believe in Transformational Giving that turns donors into disciples. A quarterly permission-only newsletter for our clients and anyone who supports our mission to protect life, promote religious liberty, and support biblical traditions for marriage and sexuality.